Russian swords and sabres. Shashka, cossack sabre, kindjal. History of Russian and Ukrainian swords. Rurik dynasty ruled to Kievan Rus they helped to establish Tsardom of Russia (from 9th century). Ruriks were varangians (varjags), originally vikings from Sweden. First Russian swords were under viking influence. Typical straight sword with short guard. The same swords can be found around the Europe. These viking swords evolved from late Roman spatha or probably from celtic swords according other theories. The sabre has been known in Russia since the IXth century and since the XIVth century it emerges as the predominant edged weapon. In the – XVIIthcenturies the Russian (estate) Landed gentry cavalry, streltsy, Cossacks were armed with most varied kinds of sabres. In the 1700-1711 period sabres were dragoons’ regulation weapon along with broadswords and swords. Then they were regulation only inthe irregular units and formations – the Don and minor Russian Cossacks as well as in certain hussar formations that were in existence all through the X-VIIIth century. In the last quarter of the XVIIIth century the dragoons carried broadsword type – hilted sabres, featuring only slightly curved blades. The Russian hussar (or light cavalry) XVIIIth and early XIXth century sabre was distinguished by a broad, medium-curved blade with “yelman” (i.e. widened out in the lowest third of the blade, (tapering to a point), a plain hilt with a knuckle bow, sweeping up perpendicularly into a cross–guard with a double langet. All through the XIXth century a succession of cavalry and infantry sabres patterns were approved as regulation for the Russian army, each only slightly different from the next. For instance, all the infantry officers’ sabres laid down as regulation weapons since 1026 were in effect one or the others of the officers’ edged weapons patterns with new scabbards approved as regulation. Since 1909 the Department of the military warrant (order) No. 409 authorized Cossacks of all the Cossack units and formations to do service with “grandfathers’ weapons” – i.e. the edged weapons inherited from the predecessors. That decision also affected the armaments of the Guard’s Cossack regiments, wherein devised and adopted for carrying outside formations were specific officer sabres patterns, organic to them, called “clytch”es (Sham shir’s or Mameluke’s). Four patterns like that are known: the Life Guard’s Cossack regiment clytch (Sham shir), the Life Guard’s regiment clytch (sham shir), the Life Guard’s South Don Cossack battery of the Guard’s mounted artillery “clytch” (sham shir) and the Urals hundred of the Life Guard’s Composite Cossack regiment clytch (sham shir). 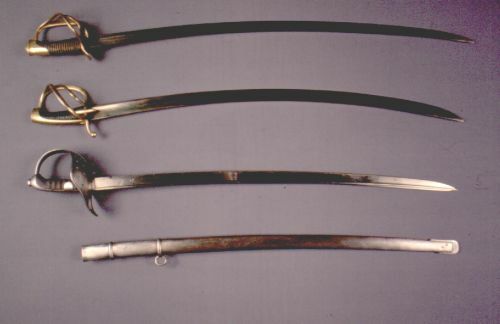 These clytches (sham shirs) replicated – in shape and scabbard ornamentation style – the light cavalry and Cossack sabres of the late XVIIIth – early XIXth centuries. 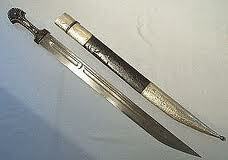 Shashka is a legendary sabre sword used by cossacks. The typical shashka is slightly curved sabre. Shashka is missing guard which is substituted by a curved pommel. Shashkas were very sharp weapons used for thrusts and slashes. Kinjal (kindjal) is a curved knife used by cossacs together with shashka. Origin of kinjal is in Caucasia and in Persia.